Resistors for our Super Bright LEDs. 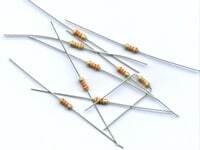 Our resistors are available in a variety of ohms & wattage. A higher wattage resistor will get less hot than a lower wattage resistor, but it will still impede (resist) the same amount. Use 150 Ohm, 2 Watt resistors with our Superflux 4-chip LEDs. Use 180 Ohm resistors for a special project or LED configuration. Use 390 Ohm resistors for a special project or LED configuration. Use 470 Ohm resistors with Blue, Green, White, U.V., Aqua & Pink LEDs. Use 560 Ohm resistors with Red, Yellow/Orange/Amber LEDs. These resistors work with any of our LED sizes - 3, 5, or 10mm. Don't want to take the time to install these resistors yourself? Grab some of our Pre-wired LEDs! Our customers have asked 29 questions about this product.